Learning how to make pizza at home can be fun and rewarding for the whole family, and it doesn't have to be hard. We will show you how to create delicious pizza dough and pizza sauce. Learn To Cook Pizza In Italy! The options for making homemade pies are endless and can range from simply buying a premade crust and adding your favorite toppings, to making dough and pizza sauce from scratch! Regardless of how much time and skill you have in the kitchen, there are many ways to make a delicious pizza at home. There's something very rewarding about creating a pizza from scratch. Every time I make a homemade pizza, I enjoy every minute of the process. From the mixing to the kneading to the baking, isn't doesn't get much better than a pie made at home. Granted, you may not have a wood-fired oven that bakes pizza at 800 degrees, but that doesn't mean you can't make a great pizza at home, especially with the right supplies. And best of all, making pizza at home is very affordable. You probably spend around $18-$20 for a large pizza delivery, especially after tax and tip. A homemade pizza can cost as little as a few dollars per pie. Learning how to make pizza dough from scratch is really not as hard as it may seem. I never thought I could make my own dough until I tried it. It was actually quite good, and easier than I thought. It may take you a few tries to get it just right, but its well worth the effort. 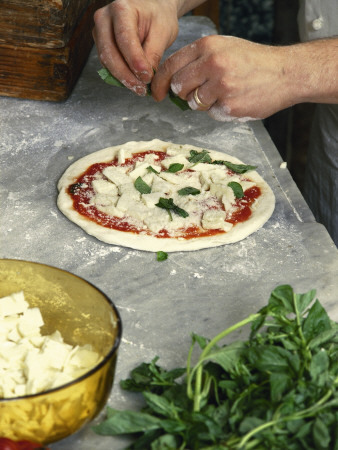 Find out how to make pizza dough from scratch. Which Flour Should You Use For Homemade Pizza Dough? When I first started looking at pizza dough recipes, I discovered that every recipe used a different type of flour. Some recipes called for 00 flour, some required bread flour and still others simply used all-purpose. The truth is, you can use all-purpose for good dough, but first, read about the different pizza flour options for your homemade pizza dough. Making homemade sauce is also easy and fun. A delicious sauce can be created with just a few ingredients that you probably keep in your pantry! And don't forget that tomato sauce isn't the only type of pizza sauce! Experiment with different sauces, such as white sauce, barbeque sauce or a pesto sauce. Remember to have fun with the spices too because the sky is the limit when making pizza sauce. Click here to find out how to make pizza sauce. Everything tastes better when it's been grilled, right? Pizza is no exception. The hot temperatures of the grill help to get that crispy pizza just right. Grilling pizza may seem strange, but it's really a great way to make an awesome, quick pizza, especially on a hot summer night. And you don't always need a pan; many take-n-bake pizzas come with a grilling pan. Learn how to grill pizza. Knowing how to make pizza is one thing, but to make restaurant quality pizza at home, you need the right tools. Below are some of the most common supplies used to help turn an ordinary pie maker into a pizza making master! Use a stone to help make the bottom of your pizza nice and crispy. You need a peel to slide that pizza onto a hot pizza stone. A good pizza cutter can make those slices just right. The perfect pizza pan will make great thin crust pizza. Try using a premade crust like Boboli pizza crust. These crusts can be found in just about every grocery store. Boboli also makes a sauce that you can buy with the crust. Add some pepperoni, cheese and other favorite toppings and you have a delicious pizza in about 10 minutes. I often buy Boboli's when the nephews come over. I buy the small crusts so that each kid can create their own pizza. It's fun for them and really quite tasty. I actually like them better then a lot of frozen pizzas. Another quick and easy option is to use refrigerated pizza dough or a crust like Bisquick pizza crust and a jar of your favorite pizza sauce. Don't feel like you have to make everything from scratch every time.